When you make Vital water, the Prill beads and/or Cosmic Energy Stones transform water at the molecular level. The water forms single molecules of 2 hydrogen and 1 oxygen atoms that are very tightly and permanently bound together. In some magical way, the chlorine and fluoride in the water are dissipated. 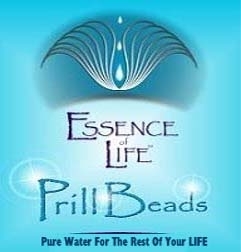 Prill Beads change the structure of water - geometry of water, making it more bio-available, more potent, and tasty. The regular water has a rating on the Bovis Scale of about 2,000 (depending on the water - few hundred more or less). The Bovis scale measures the life energy of things. Anything below 6,000 is dying, anything above 6,000 spins is life enhancing. The Prill Beads bring water to 400,000 on the Bovis Scale. 1) Rinse off the beads very very well to wash off dust, etc. from the sack of Prill beads. 2) Fill a glass (do not use plastic or metal) gallon (4 liter) jar container with the best water you are able to get. 3) Put washed Prill beads into it (with or without sack). It will sink to the bottom. 4) Allow it to sit for 24 hours. 5) Vital water is now ready for use. You can pour off 3 quarts (3 liters) of water every hour - from this day on - the rest of your life - for use, as you need it. Share the water with friends. Many user reports are confirming excellent improving health results just by placing stones directly on the skin or in the pocket. 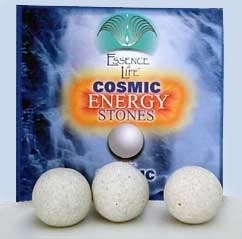 Cosmic Energy Stone is based on Laminar crystal technology (like Prill Beads), blended with a high-end, bio-ceramic clay, molded into sphere, 3/4" in diameter and fired at extremely high temperatures. When this blend is fired at a certain, very high temperature, an alchemical transformation occurs and the resulting Cosmic Energy Stones have properties that are greater than the sum of the ingredients that go into the creation of the Stones. 1) Cosmic Energy Stones always work best in triads (3, 6, 9,..). 2) Wash the stones, place them in a stove-safe glassware container or stainless steel pot with max of 4 liters of water (gallon). 3) Bring the water to full boil and then lower the temperature to a slow boil for at least 21 minutes. 4) After the water has cooled, it may be stored in any container, and will have acquired Bovis Scale energy reading of about 4,000,000. 5) After a lapse of time, perhaps 30 days, the energy of the water may begin to dissipate. To keep it optimum, place one single Stone in a storage container to counteract the diminution of its energy. Place 3 or 6 Stones plus one bag of Prill Beads, in 4 liters of the best water you can get (gallon) use a glass container, let it sit for at least 6 hours and the Bovis Scale reading jumps up to a phenomenal level in the billions! 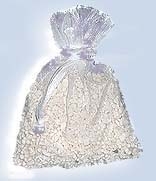 Prills Beads are crystals of magnesium oxide prilled into small irregular beads, packed into an organza bag and charged in the laminar crystal chambers. Originally created to clean up nuclear waste, they are from a new technology that allows us to make very fine "vital water" from virtually any source. Prill Beads, Cosmic Energy Stones do not dissolve in the water, but seem to last forever. They contribute no minerals. When Vital Water, which is very much like dew, replaces the energy of common water, the new liquid is technically just water. However, these molecules are smaller and do not occupy as much space as other energies. Therefore, this water is far easier for living cells to absorb, and is a much better moisturizer. Highly beneficial for Pets, plants, and people. The light energy emitting from the Prill Beads and the Vital Water has been seen as a blue color. For those who can see this, it also travels. It has been seen spreading across the floor and up walls and ceilings, making a blue web-like structure, connected with blue dots. Some of you will recognize this as the "fourth seal" energy: love. If a regular tap water source is used, this water will be greatly improved. If your water has either chlorine or fluoride, leave the lid off the jar so these chemicals can escape. Since they are heavier than air, they tend to sit on top of the jar. You may need to stir the water and blow or fan it off the top. Some people just prefer to use water that has already had these chemicals filtered out. Vital Water can be stored in plastic containers, but we are told it tends to eventually corrode plastic and metal. Vital Water can be used anywhere and anyway that common water is used. Use it for all your cooking. Drink it. Some people notice a thirst for a day or so until enough of the body's water is replaced with this vital, thinner water. It also balances the pH of water to make it more useful for the body. Placed in a humidifier, Vital Water can create a very healthy environment. It repels black mold. It seems to get rid of odors and creosote that can hang in the air from wood burning stoves. A person with any kind of lung or sinus problems may find it helpful to breath in the prill water from the humidifier. You can use it to clean your fruits and vegetables. Carrots, peeled and soaked in Vital Water are enhanced in flavor and make very tasty carrot juice. Put some in a spray bottle, and you could find a hundred uses for it! In the kitchen; spray the bottom of a fry pan and/or the top of the food cooking side to give added moisture when desired. Spray-wash fruits, veggies, and your hands. Spray the counter and or the dish rag before wiping it clean. Spray Vital Water in the air to freshen and purify. In the bathroom: Use it to spray and wipe counters and the sink. Add few drops of Magnesium Oil and spray on your body. Spray hands to clean. Spray in mouth and on toothbrush for brushing teeth. Spray on your face to wash it. You can also place a bag of Prill Beads or Cosmic Energy Stone in the toilet tank to help clean up the septic or sewer, but be aware that over a long time it may be corrosive to any plastic or metal housing there. In the car: Always handy for washing hands before and after snacks. It's great for cleaning baby's bottom for diaper changes. Vital Water cannot be contaminated. It cleans up contamination. It keeps on working no matter where it is. As we use it, we begin to clean up the water of the world - one person, one septic tank, one sewer system, one lake and river at a time. * Deuterium oxide (D2O heavy water) is everywhere in our environment, 1 drop of D2O per 6,000 drops of H2O is the natural abundance, and it gets worse with each atomic test. In a test conducted, three Cosmic Energy Stones were immersed in purified water with 124 ppm of D2O. After 24 hours, the water had ZERO ppm of deuterium Oxide!